It took the last night of games to fully-determine whether it was the Detroit Pistons or Charlotte Hornets that would make the 2019 post season (spoiler: it was the Pistons) as well as where the majority of teams would be seeded for this year’s NBA Playoffs. With the scores in, the 2019 NBA Playoff field is all set and that means we are ready to get on with the post season. 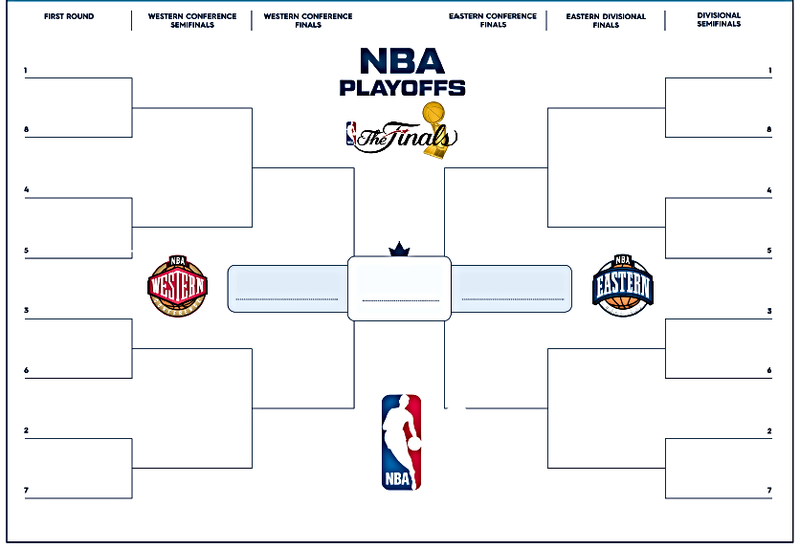 Now that the playoff picture is clear, that means we can also provide the masses with a printable NBA bracket that they can download, view, print out and hang up to follow along with all the NBA Playoff action to come. 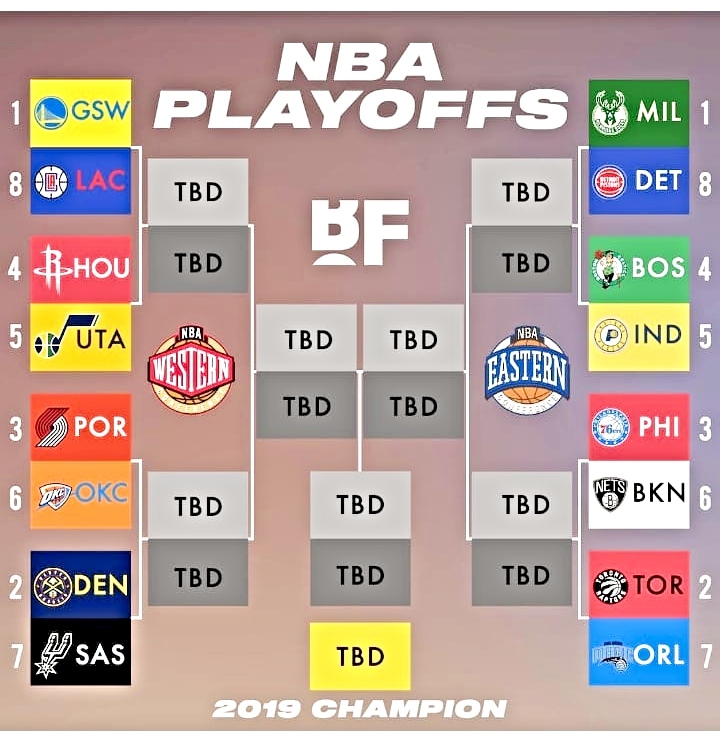 The NBA Playoffs start on Saturday, April 13, 2019. and the field has a total of 16 teams. Eight teams from the Western and eight teams from the Eastern Conference. The two number one seeds are the Golden State Warriors in the West and The Milwaukee Bucks had the best record in the entire NBA, they’re the #1 seed overall and will have home court throughout the NBA tournament. There are some really interesting match ups in the first round. The two most intriguing first round series will be the 4/5 match ups in both the Eastern and Western conference featuring two franchises that under performed for the 2018-19 regular season. First the Boston Celtics were expected to build off last season’s playoff momentum, but stumbled through the season to a #4 seed in the East. They’ll face a tough Victor Oladipo -less Indiana Pacers team that’s anchored by Myles Turner. In the West, the Houston Rockets jumped on the back of James Harden‘s incredible scoring season (and shot a lot of threes), but still couldn’t live up to the high expectations that they set for themselves from last season. The #4 Rockets will go up against the #5 Utah Jazz in the first round. The Jazz stumbled out of the gate early in the season and Donovan Mitchell ‘s shooting slump, but ultimately got themselves together and righted the ship. They’re not as potent offensively as Houston, but the Jazz will be more than formidable on both sides of the court. It’s too bad that Dwyane Wade and Dirk Nowitzki didn’t make the playoffs this season, but we were happy to see that the NBA legends got a proper send off last night. Nowitzki played his last game and put in a double double of 20 points and 10 rebounds while Wade provided a triple-double for the Miami Heat. In front of his best NBA buds LeBron James, Chris Paul and Carmelo Anthony. You can click to view our NBA Playoff bracket in a few formats. First we offer it in JPG image. You can also download the bracket in PDF format by clicking here to view and print. Now that the official schedule is set, our printable NBA bracket is well-worth the ink and paper you’ll expend on it. Hell, print it out in a color and live a little.